showing your weekly earnings for the whole claim period. This means all (in all likelihood four) weeks that will appear in your payslip. This helps, on the one hand, to show variations in working hours between strike weeks and non-strike weeks, and to corroborate the infos between your SPT info and your payslip, which is needed to evidence loss of income as the rules for the hardship fund require us to do. Note that “Status” and “Approval date” should show whether a timesheet has been approved. In this weekly view, it is clearly visible what kind of work has been done on what day. 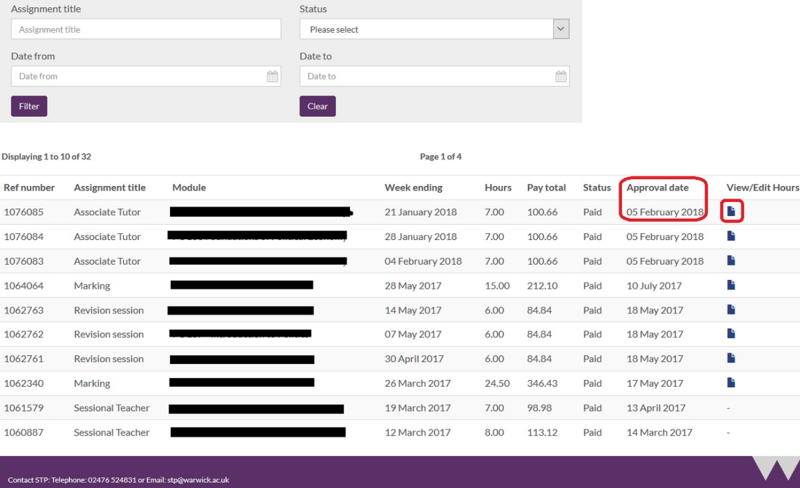 It is not possible to submit empty timesheets to STP; in which case a detailed view of the timesheet is not needed – but the overview screen above, in addition to the payslip, should show that you did not receive any pay for said week. 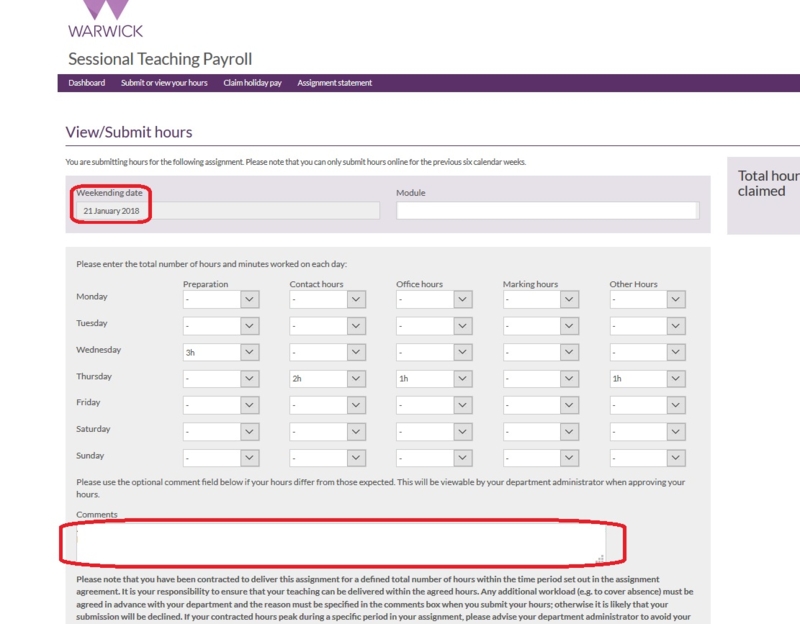 Ideally you can make use of the comment field to explain how pay has been affected by the strike (you can formulate it in a way that is useful for both the departmental approval of timesheets and for the hardship fund team to understand pay losses). Obviously, if you claim for work on a strike day, this would count as a strike day on which you haven’t participated in the strike. This is only necessary if you don’t have comparator timesheets available that demonstrate a regular working pattern. In this case your contract / job assignment should give us some clue of your expected earnings. There will still be individual cases that will remain confusing, in which case please help us to understand the claim using the comment box in the application. – OR a screenshot / copy of a bank statement showing the relevant bank transfer from Warwick in March compared with a previous month if available). Note that timesheet submission deadlines for February-March are 12/03 (STP) and 05/03 (VAM), while the paydate for all payrolls is 24/03. Timesheet submission deadlines for March-April are 15/04 (STP) and 06/04 (VAM), and the paydate is 24/04.